Drug delivery is often confined to consideration of formulation and in vivo delivery. The definition of drug delivery during template/lead selection and optimization should be considered to encompass a number of situations within the screening funnel (Figure 2). "Drug delivery" can relate to 1° activity assays typically run as part of a HTS platform, wherein "delivery" relates to the accessibility of the compound to interact with the corresponding target. Obviously, the compound has to be in solution and "free" for interaction with the intended target, i.e. the ability to interact is dictated by the |i of the compound. Figure 2. 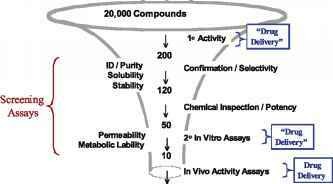 Example of a lead selection funnel and the role of both in vitro and in vivo "drug delivery" in the funnel. 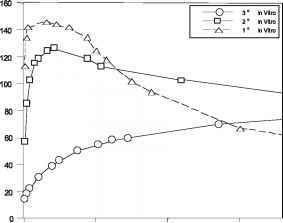 "Also noted high variability on repeat assays "
Figure 3. Potential ramifications of "drug delivery" problems in the screening funnel and the impact on potency readouts. can result in very different dilution sequences between assays and types of media exposures through the dilutions (Figure 4). It is generally perceived that this should be irrelevant with respect to the final readouts, but these different dilution sequences and media manipulations can lead to convoluted results wherein structure activity relationship (SAR) becomes difficult to interpret. Taken to the extreme, the SAR can reflect physicochemical properties such as solubility, propensity to precipitate or propensity to undergo protein binding, yielding a structure property relationship (SPR) as much as it does SAR. Figure 4. Examples of dilution sequences used for in vitro assays during lead optimization screening. Dilutions of more than 100 fold are difficult with most liquid handling equipment, hence sequential dilutions are often used. Figure 5. Example where a poorly soluble lead results in precipitation (monitored by turbidity) when making the first dilution from DMSO into various media for each of three different in vitro assays (see Figure 4 for dilution schemes). As observed in Figure 5, precipitation of compound (observed as turbidity) can occur very rapidly upon dilution of both the 2.5 or 10 mM DMSO solutions of compound. In some cases, the turbidity decreases with time due to aggregation of precipitated primary particles into larger aggregates, which can then settle from solution. In the case of the 3° assay, the presence of the fetal calf serum (FCS) apparently retards the rate of precipitation and even limits the extent of precipitation. Within the HTS platform the timing of aliquots and dilutions can play a role in the precise amount of compound that gets transferred into the next well or dilution sequence. Depending on the situation, there may be redissolution of the resulting precipitate upon the next dilution, again a highly time dependent process which only adds to potential for variability. In some cases, simple modifications of an assay or dilution sequence can provide improvements; for example, by replacing the normal saline in the first dilution with the same casein containing buffer used for the second dilution, it is possible to obtain the same final conditions, but the presence of the casein is shown to reduce the turbidity by almost 7 fold and the subsequent tendency to aggregate and settle. Similarly, including human serum albumin (HSA) in the phosphate buffered saline (PBS) almost completely eliminated any evidence of precipitation for many of the compounds following the first dilution. The physical chemistry background of pharmaceutical chemists can be advantageous when working with the biologist designing the assays, ultimately leading to improved assays with less variability and ambiguity in the readout. Even though the presence of the these different proteins can be very valuable with respect to preventing precipitation and increasing apparent solubility, they can also act to sequester the drug and decrease the "free drug" concentration. In the above example, Raub and coworkers (1999) were able to demonstrate that the free drug concentration for the compound in question was very different in each of the media and dependent on the amount and type of protein in those media (Figure 6). Such protein binding can completely mask the actual potency of the molecule (Figure 7). 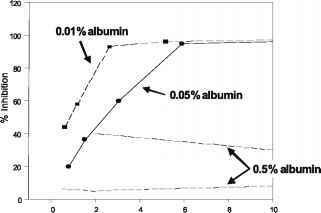 Through a reduction in the amount of albumin present, improved readouts on activity, for what appeared to be an inactive compound at the 0.5% albumin level, can be obtained. It is obvious that the optimized lead will have to be highly potent and active in the presence of albumin to be a viable drug candidate, but the ability to unambiguously assign structural modifications, during lead optimization, to alterations in receptor binding versus protein binding is critical for rational drug design. While it is impractical to determine binding constants for all potential leads during the optimization phase, it can be very helpful to develop the screening assays in a such a way that they can be run at more than one concentration of albumin or other potential binding protein. Figure 6. 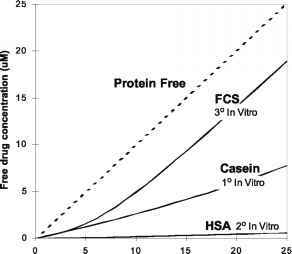 The effect of protein binding and free drug in various screening assays which each employ different media components and proteins. Curves were determined using appropriate binding constants determined by independent experiments. Figure 7. The presence of serum albumin protein can mask the actual interaction with the desired target and greatly impact efforts to generate SAR around target binding. The value of using several protein concentrations to help deconvolute the data is demonstrated. components of the assay or model and be able to recognize when SPR versus SAR is actually being probed. While the deconvolution of data may take time up front, it can avoid generating erroneous SAR. Systematic and logical drug design, with analog synthesis driven by computational models, make it even more imperative that the output of screening assays is representative of only the intended target binding and not convoluted factors which will derail the value of the computational model. 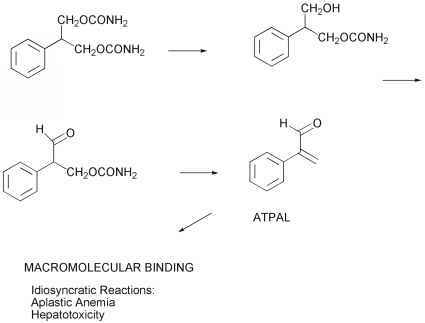 Therefore, while the involvement of pharmaceutical scientists to help the search for more druggable compounds is valuable, it is equally important that they also provide greater clarity to the funnel and assist in eliminating or selecting data to feed into the computational models. It is often assumed that poor solubility, high protein binding or poor permeability, all leading to inadequate exposure to drug, will all tend to eliminate compounds which are minimally acceptable, anyway. What is very difficult to sort out, is the impact of lost opportunity due to chasing SAR on a convoluted target, or the probability for false positives as well as false negatives. It is generally assumed that these physicochemical limitations will result in false negatives, but in our experience, poor physicochemical properties can also lead to false positives in the screening assays. The occurrence of a false negative or positive is highly dependent on the assay and how the readout or reporting system will be influenced by aggregates and particulates, or the potential for coprecipitation of compound and reagents in the assay. Often overlooked is the potential of compounds to have intrinsic surface activity or detergency leading to self-micellar-ization (leading to a disconnect with concentration added and the |) which can lead to sequestration of reagents in the micelle or nonspecific membrane perturbation in cellular based assays (McGovern et al., 2002). While many of these types of interferences cannot be avoided when screening, the potential ambiguity they create needs to be recognized so it can be dealt with.